I have been backpacking for 10+ years in locales from Chile to Alaska. I have experienced temps from -30 F (-34 C) to 100 F (38 C), heavy precipitation in virtually all forms, and winds exceeding 75 mph (120 km/h) - in everything from desert to rainforest to glaciated peaks. Most of my trips are 1-4 nights climbing/backpacking less than 15 miles/day (24 km/day) in the Pacific Northwest mountains or canoeing in Northern Minnesota. I prefer to pack a tarp and minimal gear -- less than 20 lb (9 kg) -- for backpacking, but may carry twice that on alpine climbs or winter trips to accommodate suitable gear and shelter. Manufacturer: Brooks-Range Mountaineering Equipment Co.
* Note: The manufacturer's printed materials and the website also had references to a weight of 3.1 lbs (1406 g) for this shovel. The listed weight recorded above was found on the website and is closer to the actual measured weight. My first impression as I picked the individual shovel pieces out of the shipping box was that each piece felt "solid." Not necessarily heavy, but solid and very durable. I saw that the Sharktooth blade was covered with a protective rubber tubing with a slit along one side. When I removed the tube, I realized that protection from that blade edge is necessary. Yikes! Those are some big teeth! And sharp, too! I will likely keep the rubber tubing for protection while in storage or while in my pack. If not protected, I suspect the teeth could do some serious damage to any softer materials with which it comes into contact. At the same time, I am looking forward to experimenting how easily the teeth are able to rip through snow and ice! It appears the manufacturer has a misprint in both their website materials as well as the printed materials that were sent with the shovel. Both places list the shovel weight to be 3.1 lbs -- which is the same weight listed for the regular (non-mini) version of the shovel. The shovel is nowhere near that weight! Though I would not consider this a "lightweight" shovel, when you consider the generous blade size, the solid feel, and the long handle length, my impression that it is a lot of shovel in relation to the measured weight. The manufacturer claims that this is the longest handled backcountry shovel on the market. After putting it together, I can attest that I have not ever seen a longer backcountry shovel elsewhere. Just based on the physics of digging, this seems as though it will allow the user to shovel snow in greater comfort. At the same time, a longer handle will necessarily apply more force to the shaft when using the shovel as a lever to pry snow when digging. 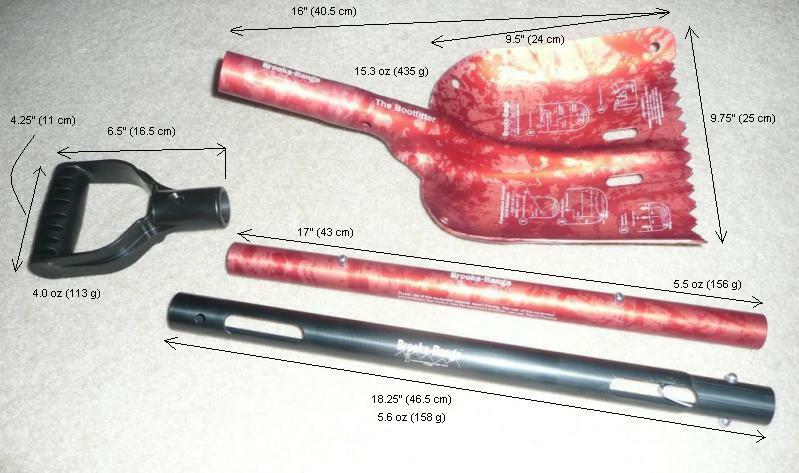 According to the manufacturer's catalog and website, the two telescoping shaft pieces are designed to be used as part of a system that uses skis to construct a backcountry rescue sled. I don't have plans to purchase the rest of the system to determine how it all works together, but it does appear to be a slick system. Two other noteworthy features of the shovel were the holes in the blade on either side of the center that allow it to be used as a deadman anchor in the snow and the "Companion Rescue Quick Reference" guide laser etched into the blade. Both of these features could prove useful in an emergency situation. The manufacturer laser etched a personal moniker on the shovels they sent us for testing. This option is also available to the consumer if purchased directly from Brooks-Range Mountaineering Equipment Co. at a cost of an additional US$10 US. When ordering from the Brooks-Range website, there is a box to select whether the purchaser desires this personalization option. 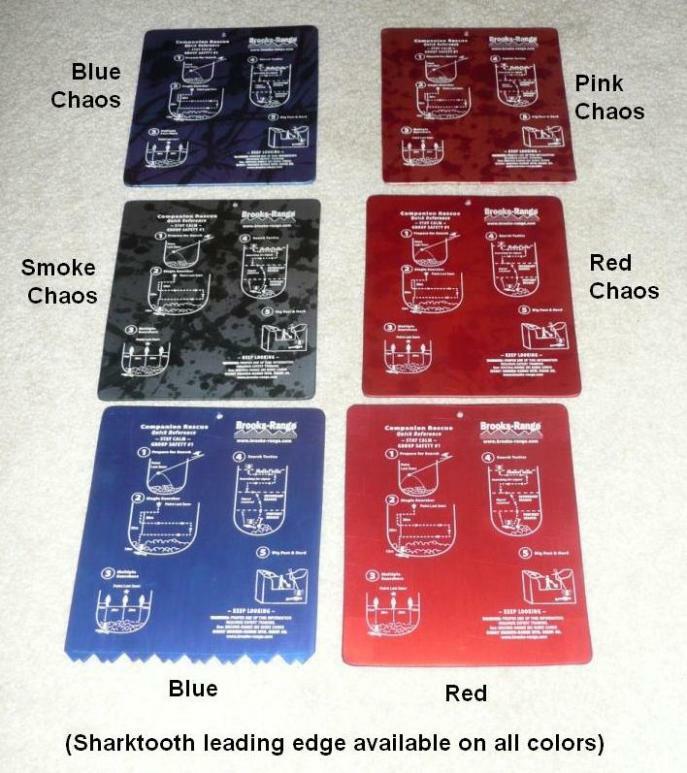 Finally, the manufacturer included six sheet metal plates, each with one of the six color options available for their shovels. A single postcard-sized sheet of paper was included with the shovel that read "Assembly Instructions." However, this sheet did not illustrate how to piece the shovel together. Fortunately, I did not find it a difficult task -- especially since I have used telescoping shovels previously. Essentially, the pieces fit together by snapping the metal buttons into the holes in the only places where they will fit. The instructions included a blurb regarding how to remove the two shaft pieces for use with the rescue sled system. Assembling the shovel from the individual pieces and adjusting from packed mode to extended mode was easy enough with bare hands. I also attempted the task with several handwear options: liner gloves, light softshell gloves, heavy shell gloves, and bulky mittens. While it become slightly more difficult with bulkier handwear, I never considered the task to be difficult in any way. I noticed that the oblong holes in the shaft (for use with the rescue sled system offered by the manufacturer) caused a minor inconvenience when I connected the two shaft tubes or when I changed the shovel between packed mode and extended mode. The pop-up buttons that fit into the intended small connector holes popped out into the oblong holes. I quickly adapted by giving it a half twist before changing the length. This appears to be a well-constructed shovel, capable of moving lots of snow and digging into even the hard stuff. I'm excited for the snow to start falling so that I can take the shovel into the field! Given our late start to any significant snowfall and the recent high avalanche danger, I have only had two good opportunities to use the shovel thus far. I have found the length of the shovel to be a big advantage when digging in an open area but a disadvantage when using it in a smaller space (i.e. inside of an igloo). The teeth on the shovel really do make a significant difference in how well the shovel can cut through icy, consolidated, or crusty snow. At the same time, the sharp (!) teeth do require caution during use. I feel the scoop size is small in relation to the length and weight of the shovel; however, the shovel is available with a larger size scoop. Finally, I experienced some inconvenient icing in the shaft slots that prevented me from adjusting the length of the shovel during use. * An overnight trip to White Pass in Washington State to build an igloo. Several inches of snow fell overnight, and I ended up using the shovel to dig out my car in the parking lot the next day. Elevation: 4,000 ft (1,200 m). Temperature: 15 to 30 F (-9 to -1 C). All use was in developed areas near the ski area. * A day hike to the top of Mount Si in the central Cascades of Washington State. I carried the shovel on my pack to the top and used it to dig into the crusty snow in the basin at the top -- just to test out the cutting ability of the teeth. Elevation: 450 - 4,000 ft (140 - 1,200 m). Temperature: 30 to 36 F (-1 to 2 C). My twelve-year-old daughter and I traveled to White Pass in the south Cascades in Washington State to sleep overnight in an igloo. We used the Brooks-Range Sharktooth shovel while constructing our igloo. It had snowed several inches the previous night, so there was significant, moist snow on top of a crusty layer. * The shovel handled the surface snow with ease and the sharp teeth easily bit through the crusty layer. * The length of the handle was very advantageous in scraping surface snow from farther away and digging deeper -- minimizing the effort required without having to bend over as much. * The small-ish scoop of the shovel made many scoops necessary to move the amount of snow required to build an igloo. * Because our igloo construction required the two of us to be in close proximity to the shovel in action, I felt a little uncomfortable using it around my child. This shovel is not a toy; those teeth are truly sharp! They could easily break rip through clothing and skin with enough force. I hope I do not experience this! Because of the last two points above, we ended up switching to a different shovel to complete the construction of the igloo. We collapsed the shovel to its small size and set it aside during the remainder of the igloo construction. Once the igloo was finished, I used the shovel inside the igloo to scrape excess snow off the floor and clean up the door opening. The 3 ft (0.9 m) length of the shortened shovel made working inside the small space of the 7 ft (2.1 m) diameter igloo somewhat awkward, but the sharp teeth were very effective at scraping the crusty, uneven floor into a smooth surface. 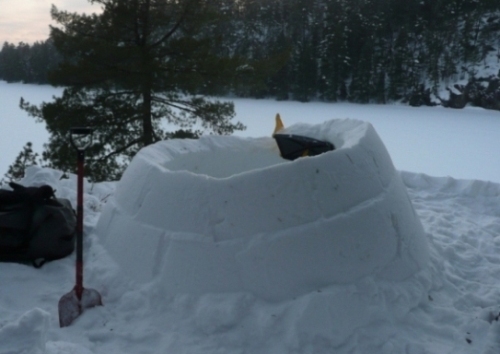 After exiting the igloo, I attempted to lengthen the shovel to put a final few scoops of snow on top of the igloo. Unfortunately, the shaft had iced up. Presumably, the snow had melted while I was using the shovel and then subsequently froze. Try as I might with mittened, gloved, or bare hands, I could not depress the spring-loaded button to extend the shovel. I noticed some ice had formed in the slots in the shaft of the shovel, so I tried to scrape this off. I tapped the shaft lightly against a wooden bench in an attempt to knock the ice out. These attempts were not successful, and I resorted to bringing the shovel indoors to allow the ice to melt before I could lengthen it again. 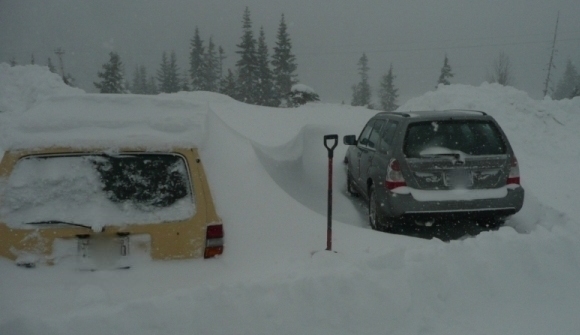 By the next morning, another foot (0.3 m) of snow had fallen. Fortunately, the wind blew most of the snow around my vehicle. (The car next to mine had suffered two significant snowfalls and was not so lucky!) The shovel worked very well to clear the snow from around my vehicle. Again, the scoop didn't move snow very quickly, but it worked. I also was very careful around the tires and the body of the vehicle. I took the shovel on a day hike to snow-covered Mount Si in the central Cascades of Washington State in order to get one more experience with the shovel for this report. I secured the shovel to my backpack and carried it up the 3,600 ft (1,100 m) to a basin near the top of the mountain. 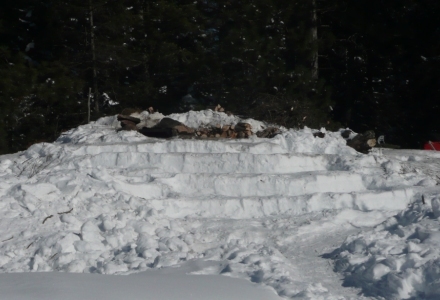 Several feet of wind-blown and hard-packed snow had accumulated in the well-traveled lookout area of this basin. I plunged the shovel into the hard-packed snow. The Sharktooth shovel had no problem biting into this snow. (There was a very noticeable difference between the Sharktooth shovel and another shovel my hiking partner had carried to the top.) The shaft felt very solid as I dug in and pried out chunks of snow. I felt no indication of weakness in any part of the shovel. Considering the icy wind that blew through the basin, we started our descent after only about 30 minutes. There was not quite enough consolidated snow to construct a snow cave. Perhaps next time! On the trail and shoveling near the top. * An overnight trip near Crystal Mountain, Washington (with the intent to build an igloo, but ended up clearing a camp site and sleeping under the stars). The skies were clear. No precipitation fell. Temperatures hovered around freezing during the day with the sun warming things up, then falling several degrees below freezing at night. Elevation: 4,000 ft (1,200 m). The snow was extremely hard-packed and icy. * A three-night trip into the Boundary Waters of Northern Minnesota. Temperatures ranged between -20 F (-29 C) and near freezing when the sun broke through the clouds one afternoon. Light snow fell intermittently throughout the trip. Elevation: ~1,500 ft (450 m). Surface snow was light and fluffy. Common areas in camp quickly became very hard-packed underfoot. * An igloo-building venture in Anchorage, Alaska, near sea level. Clear skies with temperatures just below freezing. About six inches of snow had fallen the previous weekend, and there was a layer of icy crust beneath that. For chopping into hard-packed and even icy snow, I have not seen this shovel's equal! The Sharktooth blade is truly amazing at ripping through even the hardest snow and ice. During every outing, I did a side-by-side comparison to other metal shovels that did not have the Sharktooth edge. In the hardest snow and ice, other metal shovels were glancing off the surface of the snow while the teeth of the Brooks-Range shovel dug in. Even with the teeth, the iciest snow proved to be challenging to move. But there is no doubt in my mind that the teeth make a positive difference in being able to dig through challenging snow conditions. In a real emergency, I would appreciate that advantage! On several occasions while clearing igloo or camp sites, I appreciated the long handle of this shovel! The extended length certainly relieved some of the strain I might have otherwise felt by having to bend over farther when clearing and shoveling snow. In the iciest snow during my overnight trip near Crystal Mountain, I felt some resistance and strain as I attempted to plunge the blade and leverage the handle to break off chunks of snow. However, even after applying significant pressure to get the icy chunks to break away, I did not feel this shovel was in danger of buckling. It felt solid! Carving out an amphitheater for our large group! I continued to experience issues with the spring-loaded buttons being difficult to fully depress during outdoor use, making it difficult to adjust the length of the shaft. I noticed recently that even when the shovel was indoors, the buttons were occasionally difficult to depress. Upon closer inspection, it appears that the holes for the spring-loaded buttons are slightly too small to allow the buttons to operate freely. They were binding on the edges of the holes in the shaft. My experience with the shovel outdoors suggests that this issue is exacerbated when the metal is cold. I suspect that this issue could be resolved by taking a small, tapered round file to slightly increase the size of the holes. I did not take the time to do this during the testing period, but plan to do so before future use. Initially, I found the oblong holes in the shaft (for use with the rescue sled system offered by the manufacturer) to be a nuisance when adjusting the shaft between short and long. However, as I became more familiar with the shovel, I found this to be a non-issue in the field. The only real signs of use are some very minor scratches on the shaft where the shovel blade attaches, a few dings in the blade, and some wear along the teeth on the bottom of the shovel. While clearing snow around the camp site in the Boundary Waters of Northern Minnesota, I hit some rocks that scraped the teeth along the bottom. During the testing period, Brooks-Range sent me a new and improved version of the rubber protector for the sharp teeth. My understanding is that this new version is now shipped with newly purchased shovels. It is a vast improvement over the makeshift piece of split rubber tube that I received with the shovel originally. Not only is it easier to put on the blade, but it stays on much more securely. My only real complaint after having used the shovel several times is the tendency for the buttons to stick, making the shaft difficult to adjust in length. Otherwise, this shovel has been a dream to use in a variety of snow types! Granted, at 30.5 oz (865 g), it is not a lightweight shovel that I will look forward to carrying on quick trips when I do not anticipate the need to move a lot of snow. 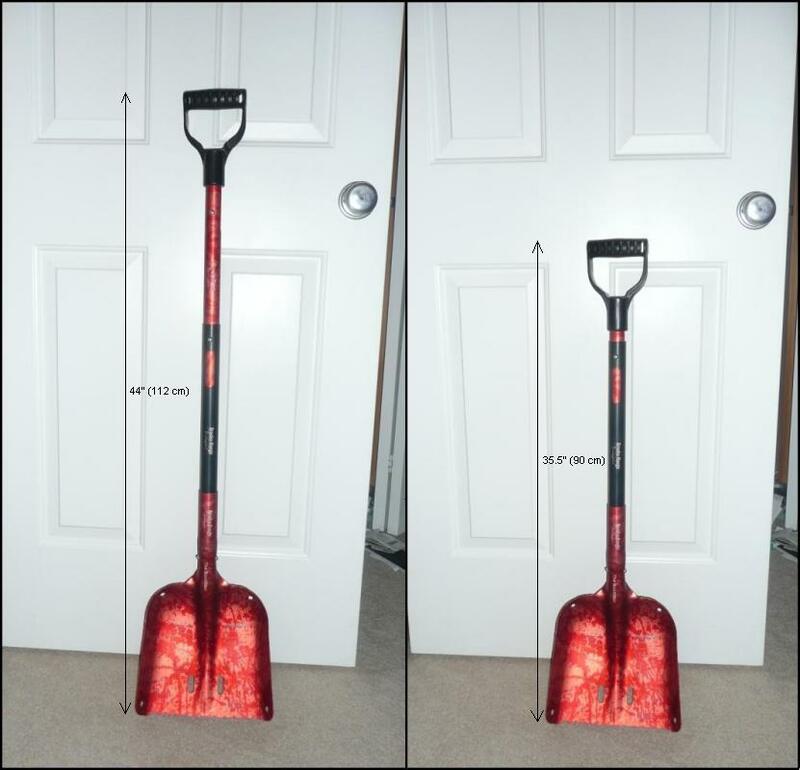 But for those trips when conditions are particularly hard-packed or icy, or when there is greater avalanche danger, this shovel will be the first one I grab. Given the length and weight of the shovel, I would opt to purchase the larger size blade if I were to purchase a new Brooks-Range Sharktooth shovel so that I could move greater amounts of snow. I plan to file the button holes in the shaft so that they are slightly larger to determine whether this helps with depressing the buttons when they are cold and icy. I enjoyed using this shovel and plan to continue to use it on winter camping trips when snow conditions may be variable and I may need to move a lot of snow. I will likely not take it on back country ski trips on a regular basis unless (as I mentioned above) there is a likelihood that I will have to move a lot of snow. This concludes my long term report. Many thanks to Brooks-Range Mountaineering Equipment and BackpackGearTest for allowing me to test this shovel!